Depositphotos is the best source for premium royalty-free stock photos, illustrations and vector art. If you are a designer, advertiser, photo editor, content manager or blogger, they have millions of high-quality photographs and vector images available at affordable prices to fill all your image needs. Their libraries are updated daily through contributor uploads that are closely scrutinized for quality and originality. Between the protections and the controls, you’re assured of finding the highest quality original artwork available anywhere. It’s easy to become a Buyer right now – just Register an account and start buying pictures today! It’s easy to become a Seller, too. Register for a Seller account and upload your images for review. Once they are reviewed and approved your images you can start selling and earning right away! The system is designed to reward the best sellers, so whether you’re a professional or hobbyist, there’s virtually no limit to what you can earn. Subscription plans allow you to download several photos each day, up to your plan limit. Every image you download using any of subscription plans is provided in all JPEG sizes and Vector images. You may purchase subscription plans of many different levels, from 3 days to 12 months, depending on your needs. It is really handy for designers that need stock images frequently. You can also try out their Free Trial Subscription too. You will be able to download any stock photos or vector images you like absolutely free of charge. 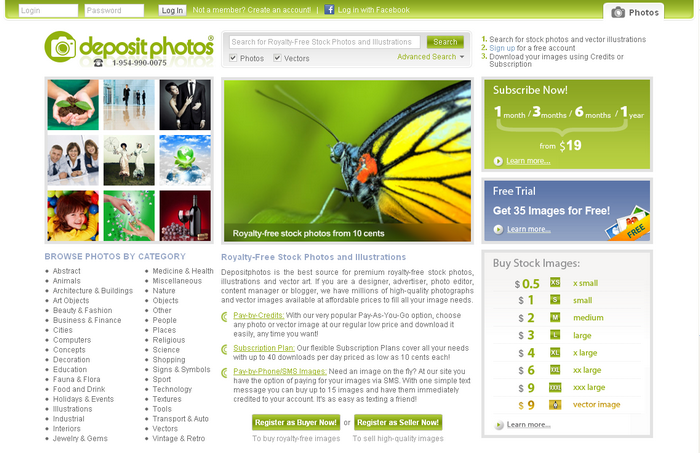 Depositphotos’ Free Trial Subscription allows users to download 5 free stock images per day for 7 days. You can use images downloaded during your Free Trial Subscription for any reason, such as personal projects, websites, blogs, newsletters, journals, advertisements, etc.